Pre-baking I wasn’t too sure about this dough, but it actually makes a mighty fine pie crust! (Can you ever tell from tasting unbaked baked goods? Oh, yes, actually, cookie dough and cake batter are both often grand…) It doesn’t taste rice flour-y or feel gritty, and it stays crisp for days once filled. Nice! Combine the flours, potato starch, sugar, salt, and xanthan gum in a food processor and pulse 4-5 times to combine. 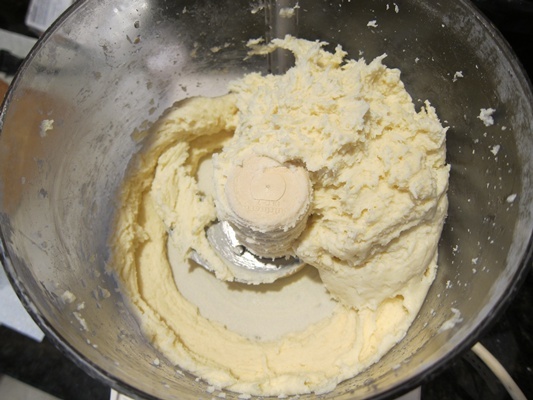 Add the cream cheese and shortening and process until well blended, then add the remaining ingredients and process until a smooth dough forms. To use immediately, lightly grease 2 9″ pie pans, then pat half the dough into each pan with wet hands. Get it as evenly spread across the bottom and sides of the pan as you can, then crimp the edges and prick all over with a fork. I clearly did not make very nice edges. Put in the freezer long enough for the oven to come to 425 degrees, then bake until the edges are golden brown, about 15 minutes. A bit of cracking, not terrible. To use the prepared dough later, form each half into a disk about 1/2″ thick, wrap in plastic, place in a freezer bag, and freeze. When ready to use, thaw for 1 1/2 hours at room temperature, then roll out to a 10″ round between two sheets of wax paper. 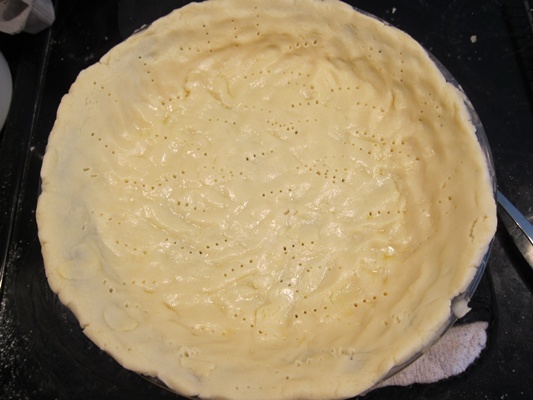 Place the pie pan up-side-down over the uncovered dough, then flip the wax paper, dough, and pie pan right-side-up. 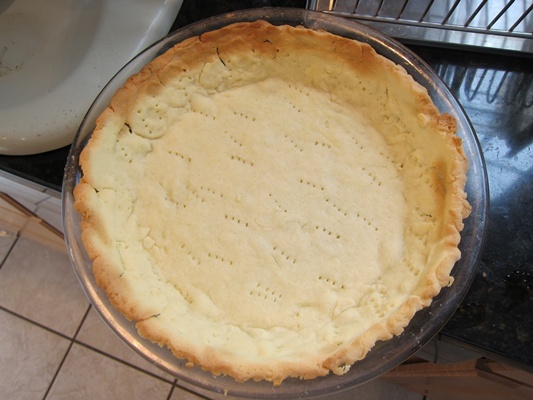 Remove the paper, straighten the dough, and prick all over with a fork, before returning to the freezer while the oven preheats and baking as above. I found this method much trickier. The dough got more evenly flat, but then tried to move all over while being flipped. And don’t even ask about moving the dough without putting the pie pan over it first! Yikes. Next time I don’t think I’d let the frozen dough thaw as long, as it might have been easier to work with if it were still more firm. Either way, the finished product was pretty perfect, taste and texture-wise! From The All New All Purpose Joy of Cooking. 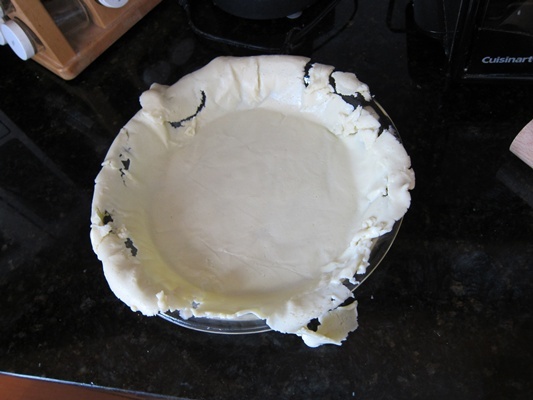 To use immediately, lightly grease two 9″ pie pans, then pat half the dough into each pan with wet hands. Get it as evenly spread across the bottom and sides of the pan as you can, then crimp the edges and prick all over with a fork. Put in the freezer long enough for the oven to come to 425 degrees, then bake until the edges are golden brown, about 15 minutes. To use the prepared dough later, form each half into a disk about 1/2″ thick, wrap in plastic, place in a freezer bag, and freeze. When ready to use, thaw for 1 1/2 hours at room temperature, then roll out to a 10″ round between two sheets of wax paper. 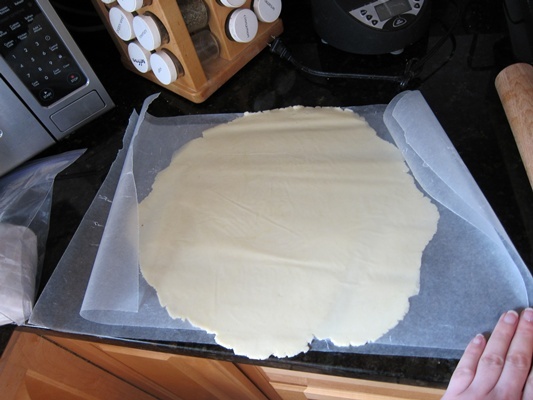 Place the pie pan up-side-down over the uncovered dough, then flip the wax paper, dough, and pie pan right-side-up. 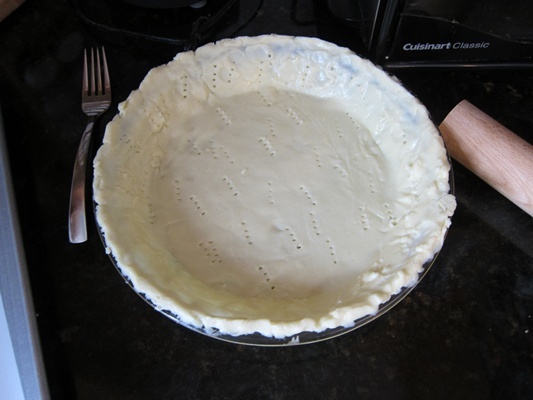 Remove the paper, straighten the dough, and prick all over with a fork, before returning to the freezer while the oven preheats and baking as above. 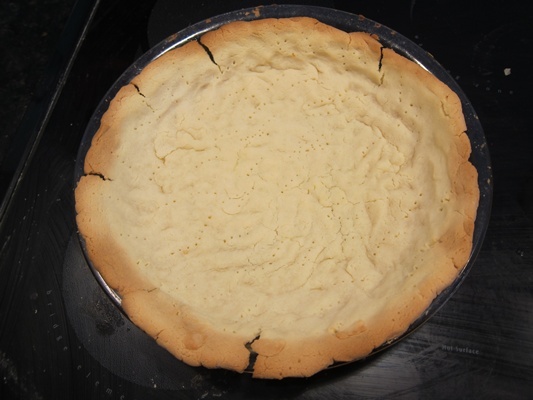 This entry was posted in Dessert and tagged gluten free, Pie, pie crust. Bookmark the permalink.